According to Merriam-Webster dictionary, a watershed is a region or area bounded peripherally by a divide and draining ultimately to a particular watercourse or body of water. It is an area of land that captures snow and water, divide that keeps flowing waters apart. When excess water is created during rainfalls or snow melts, a watershed carries the excess water from land and little by little, the water is directed into soils, groundwater, marshes, creeks, steams, rivers and eventually into lakes and sea. 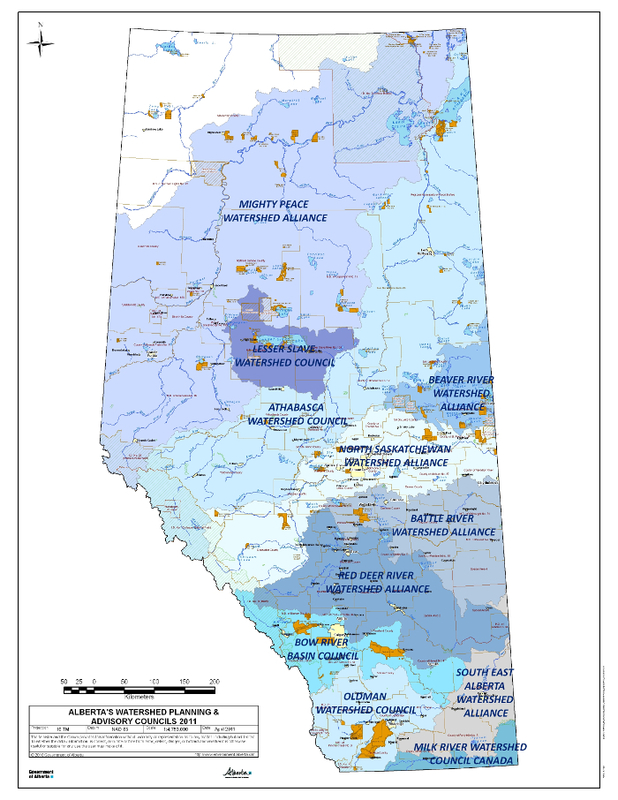 "Alberta's Watershed Planning Advisory Councils 2011" by Alberta Environment. Click to enlarge. For more information on the individual WPACs and the area they cover go to the individual WPAC websites.